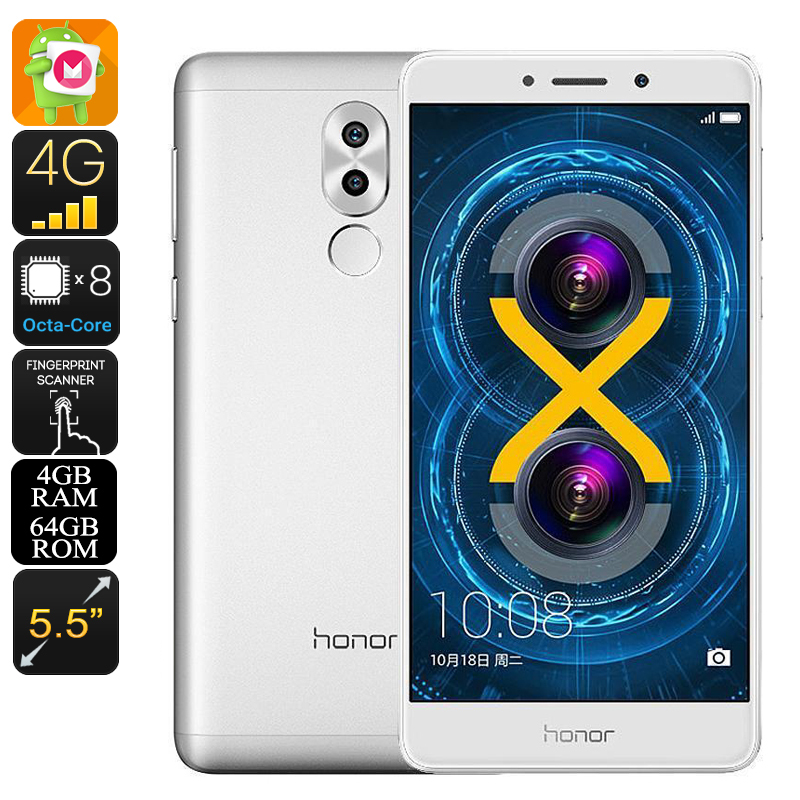 Successfully Added Huawei Honor 6x Android Phone - Octa-Core CPU, Android 6.0, 5.5 Inch Display, Dual-IMEI, 4G, Dual-Camera, Fingerprint (Silver) to your Shopping Cart. The Huawei Honor 6x is an Android phone that will bring along great connectivity thanks to its Dual-IMEI numbers and 4G support. By allowing you to be reachable on two phone numbers while using merely one device, this mobile phone is perfect for separating busy business and private life. Its 4G connectivity additionally supplies you with the fastest mobile data speeds out there, allowing you to surf the web and stay in touch with friends and family anywhere you go. No matter where your upcoming holiday or business trip will take you, with the Huawei Honor 6x at your side, you’ll always stay connected to your colleagues, friends, and loved ones back home. Within its sleek metal body, this Android smartphone packs a sophisticated Octa-Core CPU. This processor that has been clocked at 2.1GHz brings along plenty of power through which it allows you to play games, watch movies, and enjoy the latest mobile applications on the go. Besides its powerful CPU, this Chinese smartphone furthermore holds 4GB RAM – letting you engage in multitasking sessions without needing to worry about slowing down this high-end Android device. Featuring 64GB of internal storage and a 128GB SD card slot, there will always be enough space for you to store your files and media alike. Featuring an absolutely breathtaking 5.5-Inch display, this Android phone lets you enjoy all your favorite movies, games, and more in crisp 1080p resolution. Its epic 3340mAh battery brings along 5 hours of continuous usage time, enough for you to get through the most demanding of days without needing to worry about running out of juice. Whether you’re into mobile gaming, movies, or simply like to browse the web – with this Huawei phone at your side, you’ll never have to feel bored again. What really sets this mobile phone apart for similar devices is its stunning dual-camera. Capable of shooting 12MP pictures and recording Full-HD video, this professional-grade camera allows you to capture all those special moments in life. Additionally, the phone also holds an ultra-fast fingerprint scanner that provides you with high-end security and an efficient way to access all your files. No longer will there be the need to remember long passwords or complicated unlocking code. Simply press your finger to the phone’s scanner and within a split second, you’ll have access to all your private files.